My one and only Spotted Bass came on a deep-diving crankbait. The fact that I lived three hours from Shasta Lake and didn’t catch a Spot for nearly 26 years is pitiful. Granted, I only fished Shasta like twice and then only for trout, but still, it’s a disgrace. You know what’s even worse? Since I caught this fish, I haven’t fished Spot water, and I haven’t caught another. Marcus Moss, Zach Wieting, and I decided to head to Shasta on New Year’s Day to chase bass. I mean, they’re supposed to feed actively all winter in warmer climates, and Redding is certainly a warmer winter destination than Klamath, so it seemed like a good bet. It didn’t start off very well, though. The water was so low, each of the three ramps Marcus usually fished were well out of the water, and we had to tool around until we found one at Bridge Bay that was usable. It was still a good 10 feet out of the water, but boat ahead of us seemed to have no trouble, so we went for it. Already, more than an hour of fishing time had burned up when we got the boat in the water. None of us had waders, and the dock was too far from the boat, so the complications continued. I volunteered to get wet (smart in mid-winter, right?) because I didn’t want to give up. Once we got the boat in the water, it wouldn’t start. Another hour passed as we re-trailered it, fiddled with it, and finally got it purring. By now, it was well past noon, and it was supposed to be dark in four hours. We spent two of those hours getting one fish apiece, all on deep-diving 10XD Crankbaits and then called it a day when the wind picked up past 25 MH. 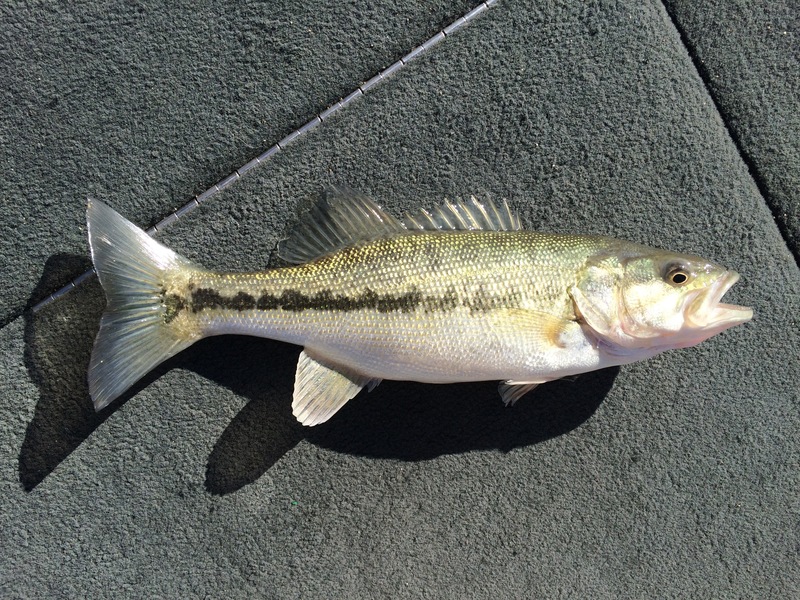 That is the story of my first (and, as of June 23, 2018) last Spotted Bass. Read the next entry in #SpeciesQuest here: Species #73 — Copper Rockfish.